Wanna get inspired with amazing email newsletter ideas for December? Read on! Ahh… December. The favorite month of many. The smell of freshly baked gingerbread cookies is filling the air. Festive lights and decorations are making the atmosphere joyful and merry. Laughter and the feeling of home are filling the hearts. All this magic of the last month of the year got us dreaming about enchanting email newsletter ideas for December. In today’s post, we’ve gathered awesome email newsletter ideas for December to help you maximize the success of your campaigns. Without wasting any more time, let’s explore the examples. December is the first month of the winter in the Northern hemisphere. In regards to your email newsletter templates, this means one thing: snow! Some people relate snow to a breath-taking beauty, others – to fun activities. Either way, making your newsletter snow-themed will impress your subscribers. Here are a few examples to get your creativity flowing. 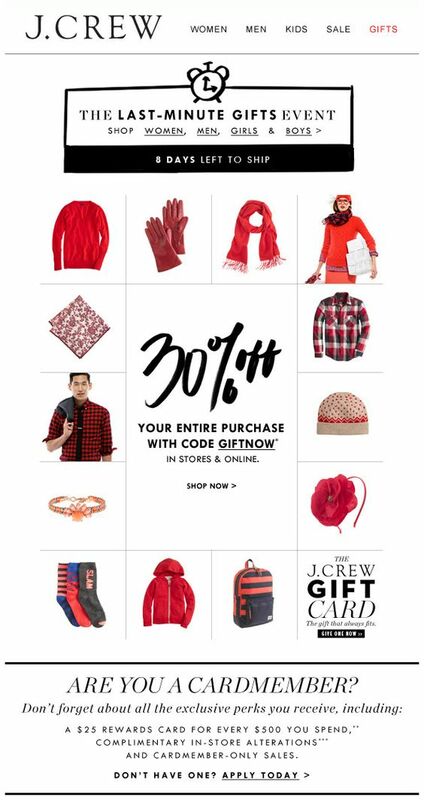 J.Crew is one of the brands that rock with their email marketing. 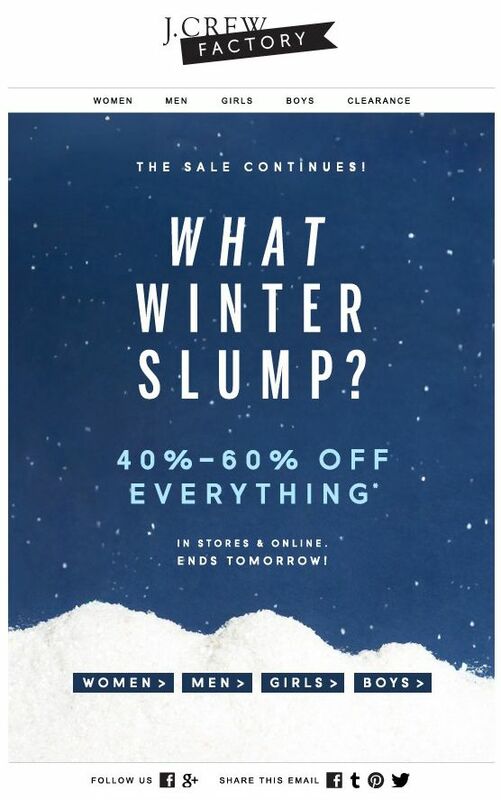 In this email campaign, they used the winter as a theme to promote their sale. Using GIF in email always spices up the inbox. 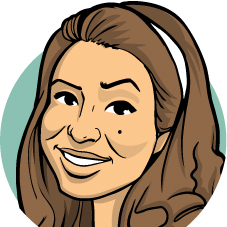 Follow this example by J. Jill to engage your subscribers with an awesome animated campaign and make them click through. Ann Taylor also surprises with ingenious email marketing campaigns. For this one, they used a snowflake as a clock to create urgency and provoke recipients to click through. In the season of giving, what a better idea for a newsletter than a gift guide? We’ve seen many brands take this direction. The tactic certainly works in favor of engaging your recipients and boosting your sales. Check out a few examples. 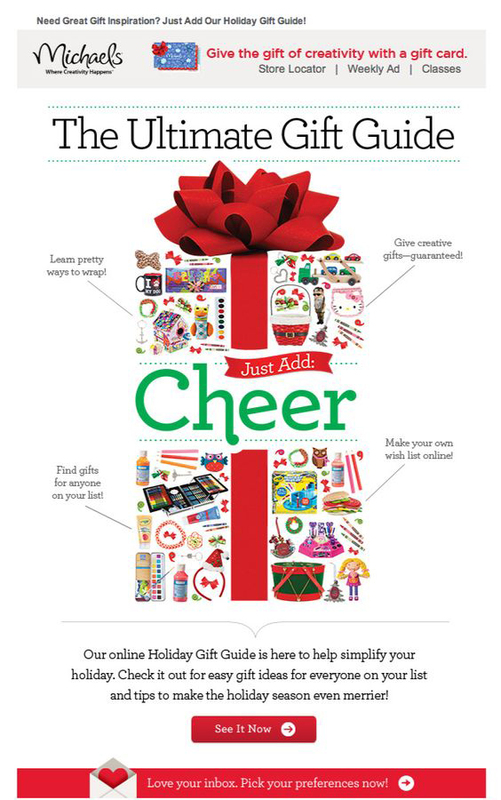 Here is a fun way to arrange your product suggestions shown by Michael’s: in the shape of a gift. You can experiment with different shapes associated with the winter and the holiday season, such as a snowflake, a Christmas tree, etc. Here is another great idea for your gift guide. 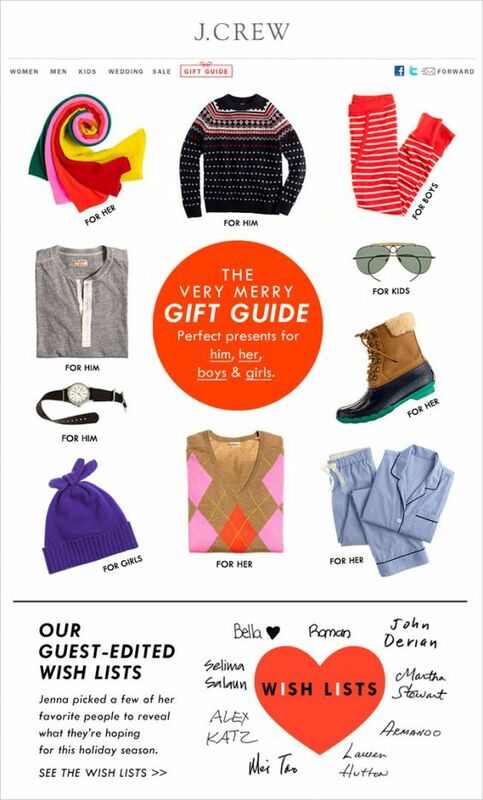 J.Crew sent a friendly email gift guide labeling each suggestion with “for him”, “for her”, and “for kids”. 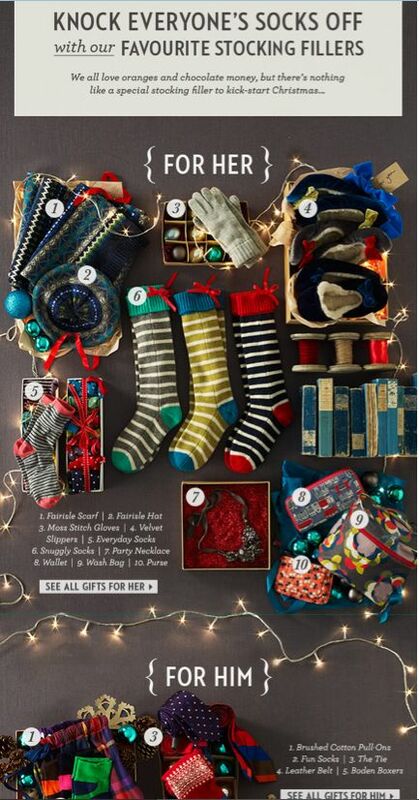 An another example of showing both women’s and men’s suggestions is Boden’s gift guide email campaign. Firstly, thet divided their email into two parts: women’s and men’s. Then, they numbered their suggestions and included a list of the items’ names. Because… why not? December is the month during which people are naturally in a good mood. This means they are more inclined to accept new ideas. Here is an example by American Eagle Outfitters. They announced a new app – a virtual closet. In the month of gift shopping, announcing an app that will help you shop more easily? For sure, this sounds like a great idea! As soon as December kicks in, people start looking for shopping deals. And you should be ready for the rising demand. 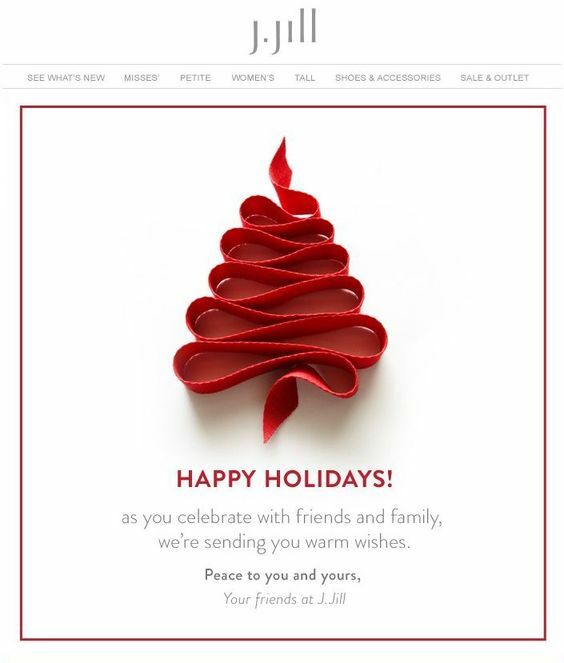 Here are a couple of examples of pre-holiday email campaigns in December. 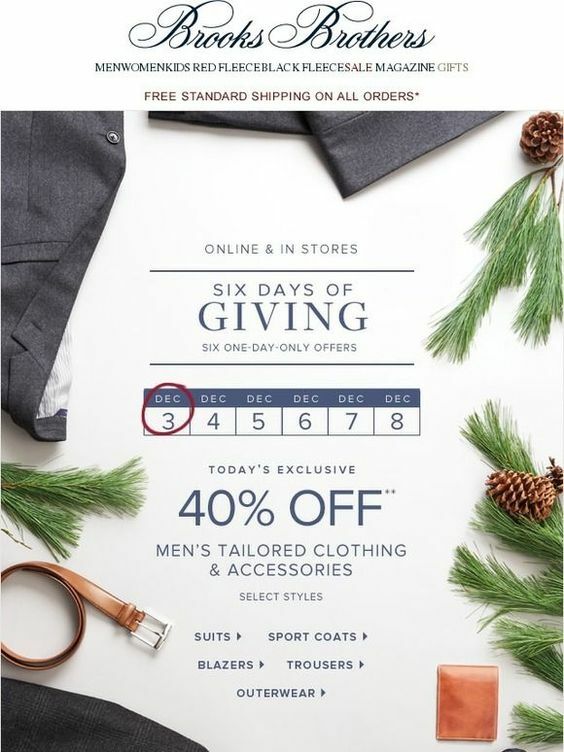 Brooks Brothers announced 6 days of giving at the beginning of December. Such a campaign not only creates a buzz but it also strengthens the brand-customer relationship as it provokes users to check the brand’s daily offer each day for 6 days. TOMS went even further by making a similar campaign for almost two weeks. Such a campaign gives you an opportunity to send a new email each day. And with people waiting for your next offer, you will certainly increase your email marketing metrics. Of course, there will always be people who leave their shopping for the last minute. And that’s where you step in. Here is an example for such campaign by J.Crew. We love how they made it red-themed and added a hand-drawn clock icon at the top, just to create a little bit of urgency. 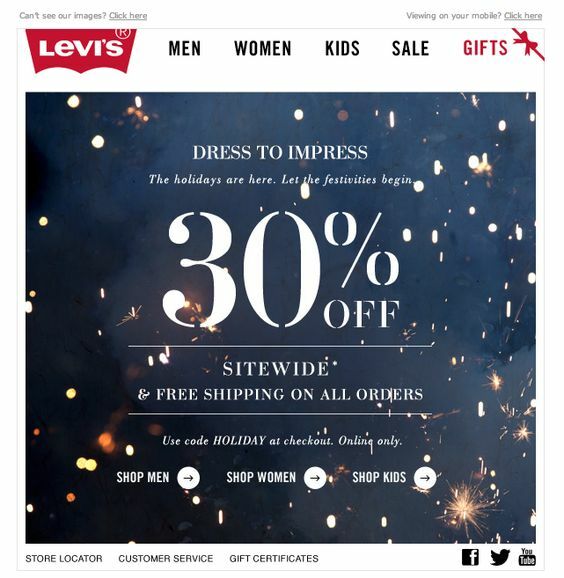 Another good example of promoting holiday sales is this one by Levi’s. They made it festive, sparkling and certainly stressing on the discount you will receive. Just to boost the mood of your subscribers, send a post-holiday campaign offering even bigger discounts. 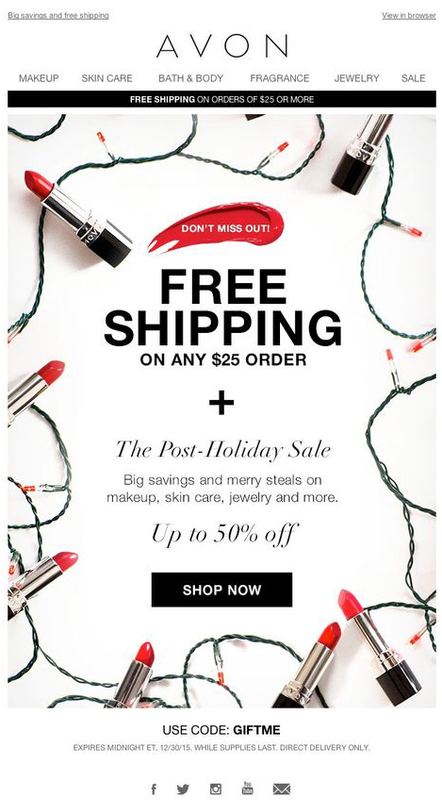 Here is what Avon did for their subscribers after the holidays were over. Just because people are in a shopping mood, doesn’t mean that all your December emails should be all about sales and promotions. December is about family. And since you really want to keep your subscribers close, it’s a really good idea to send them warm wishes during the holidays. Just to show them that you care. Because you really do, right? 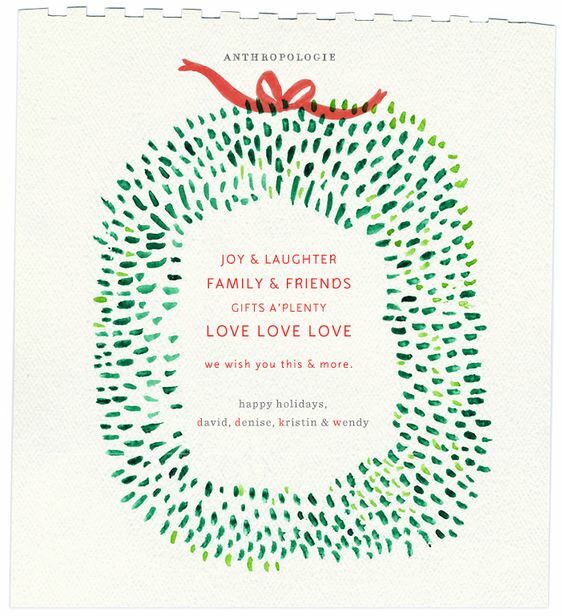 Here is an example by Anthropologie – a lovely illustrated email template personalized with the names of the real people who stand behind the brand. Another lovely example. This one is by J.Jill that sent a very elegant greeting email with a red ribbon shaped like a Christmas tree. A stylish greeting email by Barneys New York. 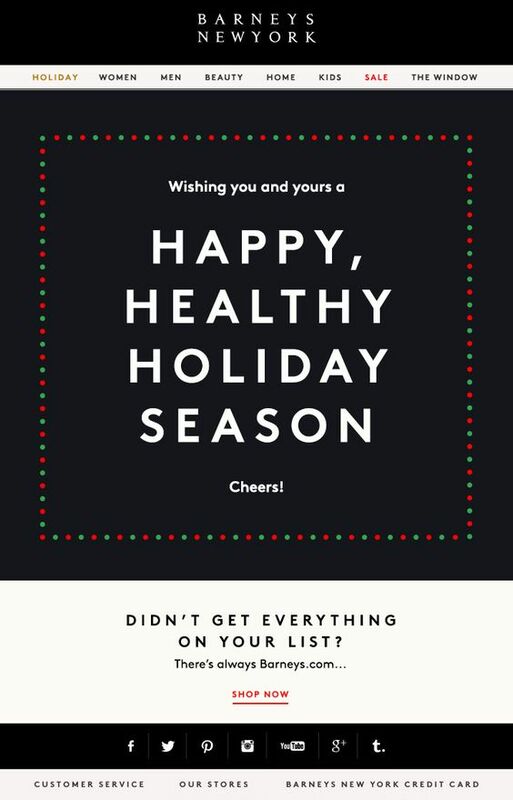 Besides sending warm wishes, they also included a small, unobtrusive call to action below. We truly hope this collection of email newsletter ideas for December got you inspired to create amazing email campaigns. If you want to share your own ideas, feel free to do so in the comments below. May all your December campaigns be merry and successful!